Over the Halloween holiday, I had the unfortunate task of dissing a Bottega Veneta handbag. As much as it pained me to criticize such an established purveyor of refined leather bags, it still needed to be done. Why? Because it's important to point out when designers go wrong. It's easy to sing the praises of a label like BV simply because they are always spot on. Usually when they falter it tends to be a whopping mistake. I'm bringing this up because I had the misfortune of coming across another blunder from a trusted designer with impeccable taste. Would you be shocked if I told you the hag bag in question comes from none other than exotic handbags queen Nancy Gonzalez? I know what you must be thinking, ladies. Nancy Gonzalez couldn't possibly screw up a bag. Oh, but she did! In fact, it's probably one of the ugliest creations I've come across in a very long time. Just look at the Nancy Gonzalez Crocodile and Mink Tote and not much further explanation will be necessary. 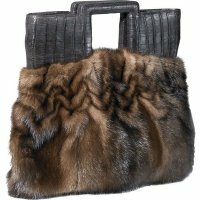 The carpetbag design is posh and sophisticated, but combining crocodile and mink is just plain absurd. That should never, ever happen. It's ugly and a waste of two very precious materials. The $3680 price tag doesn't help either. This is one of those cases when a flawless designer "jumps the shark". I suppose it happens to everyone. Let's just hope our favorite exotic handbag designer never strays this far from her error-free path.